My work evolves from an appreciation and love of Line, and from the use of the tools and materials which surround me. In the inertia of dead nature, in paper, calico, ink and found objects, I see possibility. It is only in the completion of each work that the recurrent themes of Loss and Disconnection which have characterised my work for many years become recognisable. In responding to the losses we experience on global, social and personal levels, I hope to create awareness. I am taken by the co-existence of extremes in contemporary culture: materiality and immateriality; abundance and the void; the spectacular and the silent. The title of this exhibition, REGENERATION, refers to the hope for renewal and the retrieval of loss; for regeneration through art. Except where indicated, all the prints in this exhibition are paper drypoints. Paper drypoint prints are prints taken exclusively from a recyclable cardboard matrix. Early one morning in 2013 we discovered that ten lilly pilly along Williamsons Road Doncaster had been burnt overnight. 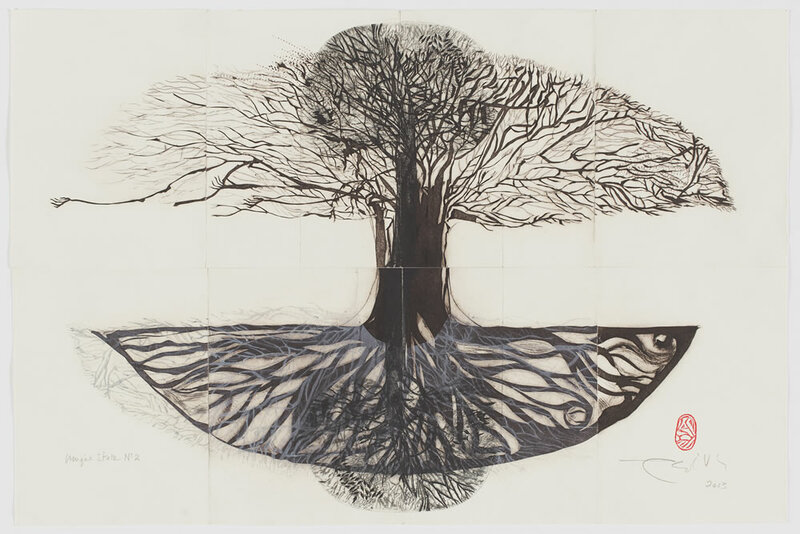 The underlying shape and the black branches of the burnt trees against the sky were the inspiration for these works on paper. This print, titled ‘Nocturn’ (rather than ‘nocturne’ which is a musical composition appropriate to the night or evening) refers to the time when the incident occurred. It comes from the Latin nocturnus, meaning ‘by night’. When the burnt trees were cut down, I picked one up and took it home where it still stands in my garden. Here is a work which is being developed from the shadows thrown by the winter sunlight through the dead tree. I hope to be able to develop the idea later as another series of prints based on the loss of these trees. One of the prints made to commemorate the social and political losses which came about as a result of global conditions at the end of the eighties, being re-assembled for the exhibition. These prints were taken from cardboard plates. They are paper drypoint prints. The drawings were made on cardboard. The cardboard plates were then incised and printed intaglio. Click here to read full CV.